Learn how to prepare Classic Three Course Dinners from the first course of Moules Marinieres to a dessert of Mousse Aux Chocolate. You'll also master classical French entrees such as Poulet Oscar packed with crab, asparagus, bearnaise sauce, and Baked Fennel w/ Comte Cheese, or the existentialist Roasted Pork Loin, which is savory but ultimately meaningless in the face of one's own mortality. 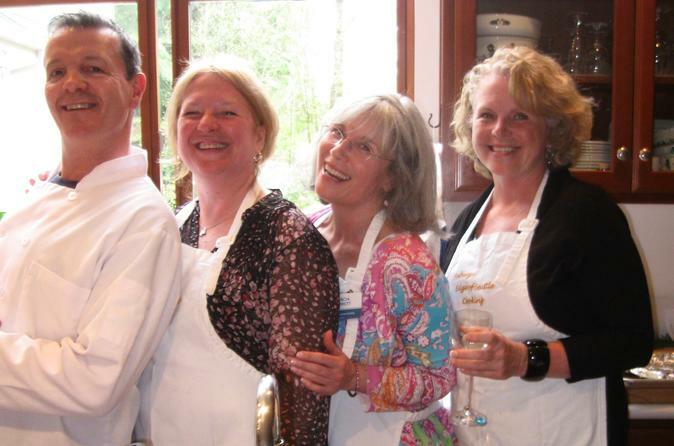 Experience "Joie de vivre" (the joy of living) every time you visit Auberge de Seattle French Country Inn and French Specialty Cooking School in Woodinville, Washington. We specialize in authentic French cuisine that will make you feel like you are dining in France. Visit us today to experience romance and luxury with great food and accommodations in our French Country Inn. We are located in an evergreen forest on the outskirts of Seattle, the Emerald City. We are a short 15 miles from downtown Seattle blending urban sophistication with scenic adventure. Reserve a room or book a cooking class with us today. For more inquiries, feel free to get in touch with us. We are looking forward to seeing you! Originally this property was built as a family home designed around my son Remy who was very sick with a terminal neurological disease. All of the space was created to accommodate a wheel chair access and activities surrounding his care. In 2001 he passed and then it was a time for reflection and creating the next step for this property. My passion is France and anything French and it seemed natural to me to want to share "all things" French with you. Even though the property is in the midst of an evergreen forest surrounded by beautiful majestic trees, I was lonely on these five acres. Realizing that I needed people in my life and knowing that I have always enjoyed hostessing and making new friends, the idea of sharing the beauty of the property with like minded folks seemed perfect. And I get to talk to people too! By 2003 I had figured out our business model; accommodating overnight guests who are interested in the experience of a staying at a French Country Inn and eating French food. Our French Specialty Cooking School was started at the same time. I hope you will take this opportunity to indulge yourself and come for a visit and stay a while. En esperant vois voir bientot chez Auberge de Seattle; a French Country Inn in the Woodinville Wine Country.